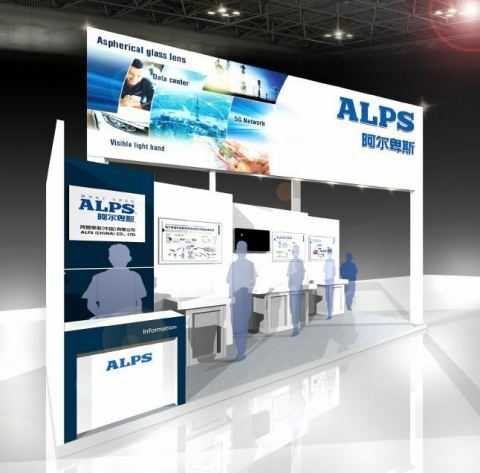 Japan’s leading electronic component manufacturer, Alps Electric Co., Ltd., (President: Toshihiro Kuriyama; headquartered in Tokyo) will be exhibiting at the China International Optoelectronic Exposition (CIOE) to be held at the Shenzhen Convention & Exhibition Center in Shenzhen, Guangdong, China, from Wednesday, September 6, 2017, to introduce the company’s time-proven lens products for optical communications. At CIOE, one of the world’s largest exhibitions in the optoelectronic industry, Alps Electric will be exhibiting the latest technologies in lenses for optical communications and the products, which have more than a 25-year history in the market in the form of optic fiber components, optical drives and pickups in CDs, and lenses for submarine cables. Under the circumstances where the volume of information is increasing because of the use of IoT and AI and thus downsizing of data center devices is wanted, the narrow aspherical glass lens, which we are introducing as a solution for data centers, boasts a width of only 0.6 mm even with a chucking area. The lens achieves high efficiency in a light coupling through the optical design and microfabrication technologies that Alps has been developing for a number of years and therefore contributes to the speeding up of data communications. The Alps booth will also propose, from our lineups for the on-board product market, the latest technologies designed to meet future demand, including aspherical glass lenses integral with lens tubes for heads-up displays (HUDs) and hybrid lenses for LIDAR systems that are used in self-driving cars.